This week we celebrated my birthday with a getaway weekend to the beaches in Malaysia. I’m living near the Malaysian border in Singapore so why not take this opportunity to visit our neighbours. We packed a light luggage and took the road by car to the border which was 30 minutes away. We needed to cross the border control. Here, everything goes fast! Thousands of Malaysians are crossing the border every day to come to Singapore to work. Everything must be done quickly, they asked, “Do you have anything in the trunk?” “Hell, no!” Anti-smoking law are severely imposed. We are not to come back with more of a one opened pack of cigarette each. We risk a $ 500 fine per pack if we do not adhere; it’s a bit expensive to just save a few dollars. Singaporeans must have more than 3 / 4 fuel tank filled to prevent them from going to refuel and return to save some tax. Many people go shopping, because prices are cheaper for certain products, mainly services such as spas and food. After crossing the bridge to Johor Bahru in Malaysia we quickly realized we left the lion city. The roads are bumpy, the cars older and there are huge advertising billboards at every street corner. Johor Bahru does not have much spectacular to offer except some shopping at good price. A few kilometres later we found ourselves in the suburban countryside. Rustic restaurants, car washes and small industries established in the same drab commercial buildings with steel fences. We were immersed in a small rural trading system that looks like what we see in Thaïland. The more we advanced on the road, the more the western influence is crumbling. Forget the 7eleven and the Macdonald’s. Prepare yourself to the 100% Malay cultural experience. 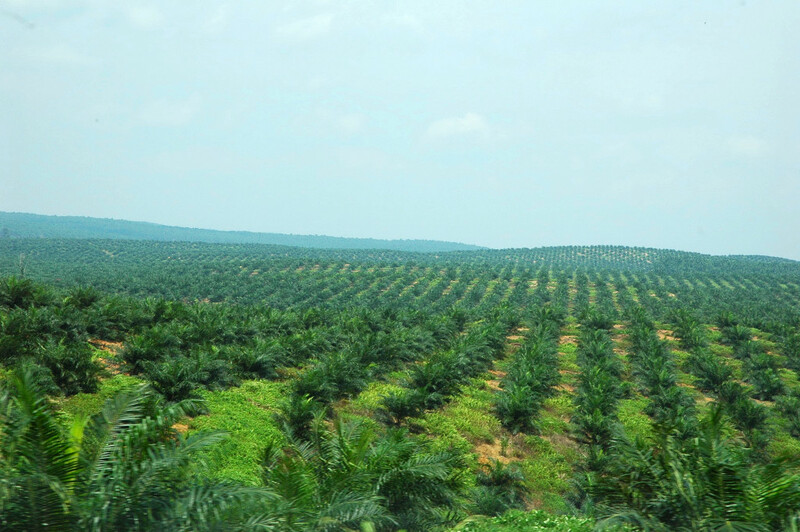 There are beautiful landscapes on either sides of the road; especially the palm tree plantations. There is a lot of roads construction. The Malaysian government is developing a new highway to reach peninsula faster. A new road will soon connect Johor Bahru to Desaru directly. Curiously the road is not completed, but the road signs are already in place. A strange planning management, but it’s Malaysia where all thing are sweet and easy. it is also possible to take the bus. You must take a bus from Woodlands in Singapore to cross the border in about 1 hour for $ 2 sing. Learn more about the bus schedule and departure times at http://www.sbstransit.com.sg.. After reaching the Larkin terminal in Johor Bahru, one will take one of the 4 times a day shuttle to Kota Tinggi; the closest town near Desaru (for a few dollars). After that, a taxi ride to your hotel for less than $ 5 or the shuttle bus for less than one dollar every 30 minutes. There’s also a ferry that connects the Changi Beach of Singapore to Johor Bahru four times daily for 22 sing dollars. It is also possible for athletes to take the ferry with their bike and ride all the way to the beautiful Malaysian peninsula. 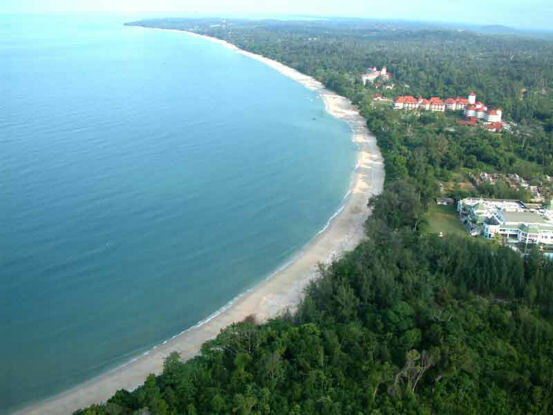 Desaru offers 22 kilometres of beach, there are some new resorts, hotels and guesthouses that are slowly appearing along the coast in addition to the aging infrastructure already in place. It’s certainly possible for the more adventurous to do some camping on the beach without being annoying. Go swimming or use the toilet near the hotels nearby does not require commando operation skill. The beach is almost deserted; the tourists are mostly Malaysians and Singaporeans who spend the weekends with family and friends enjoying the beach with white sands and emerald green water. Another interesting point: that’s no beach junk sellers and heavy infrastructure. The beach is natural and clean, the sand is slightly more yellowish and rockier than in Thailand, but it’s very beautiful and peaceful. It is a good way to visit Malaysia from Singapore without flying and add some value to your stay. You can chill on the beach or go biking, jet skiing, jogging, playing volleyball, soccer and golf. Visit the farm fruit, the crocodile farm, the ostrich farm or go fishing. it is hard to find restaurants offering acceptable quality western food even in the restaurant of the hotel. Perhaps, the breakfast buffet was varied and very acceptable and with no horrible turkey bacon. I recommend you the seafood restaurants offering good value for money. If you intend to take a beer, stop at Johor Bahru to buy it. After having a look around, being lost to dead end streets, I finally found a Malaysian Chinese store that sold beer, Tiger and Carlsberg for 7 MYR, a real discount compared to the $ 17 per can back at the hotel. Malaysia is governed in part by Islamic law, alcohol is rare and expensive. In Malaysia only the good old Chinese stores will help you quench your thirst without breaking your bank.